Marketing is an essential part of web design, and knowing its 101 helps designers see their design decisions in a broader context. 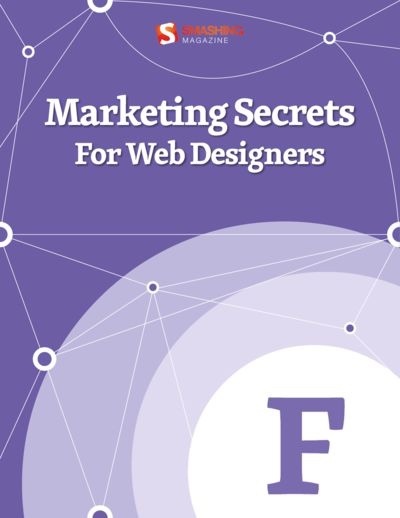 As jumping in at the deep end and simply starting off marketing can be quite delicate, Marketing Secrets for Web Designers is a companion tailored to the specific needs of web professionals. Weighing the benefits and perils of common marketing practices, it takes designers by the hand as they develop an understanding of what friendly and appealing marketing is all about. Along the way, the Smashing Magazine authors cover topics such as shaping an innovative brand identity, implementing social media wisely, and creating meaningful email marketing campaigns. Furthermore, the eBook features valuable tips for product launches and e-commerce. Of course, analytics and metrics also get their well-deserved attention. As you will discover, marketing is a lot more than plain conversion rates, numbers of sales, and generating followers; it is part of the user experience.